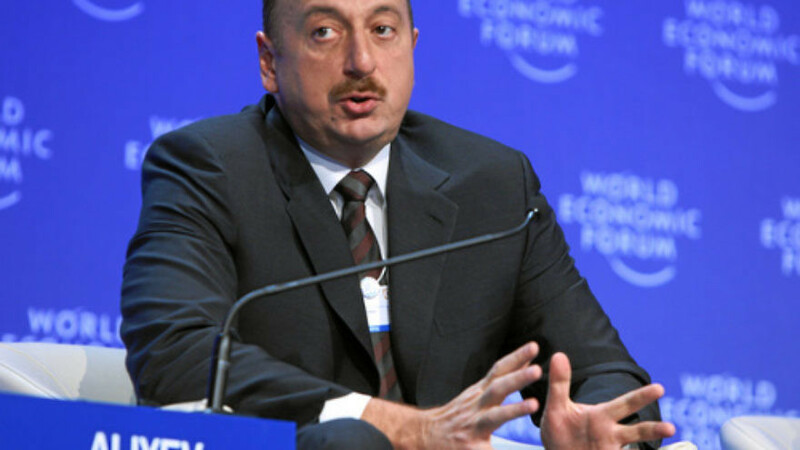 Ilham Aliyev, president of Azerbaijan, at the January 2009 World Economic Forum in Davos, Switzerland. Azerbaijan has made a rare move among nations in the Arab world: befriending Israel. Credit: World Economic Forum. (April 2, 2014 / JNS) Those of the mindset that religions are inherently at war with one another must have a difficult time reconciling the friendship between the State of Israel and the Republic of Azerbaijan. Yet, in the real world, it makes perfect sense. Muslim countries that use Islam—a traditionally peaceful religion with a rich tradition—as a weapon to stifle religious freedoms are indeed abundant, so what is different about Azerbaijan? Azerbaijan is a moderate, progressive, and democratic majority-Muslim nation that suffers the same slings and arrows as Israel regularly does from its militant neighbors, who suppress and murder those who oppose their extremist views. Israel, the Jewish state, was founded on the Western principles of democracy and the rule of law and has been falsely accused of suppressing other religious groups and minorities. That is exactly what these two countries have in common, and one of the things that allows them to share a strong friendship and partnership. Although religious principles guide their nations, as is the case with most Western-oriented nations, the tenets of religious freedom and equality for all are a basis for their governments and policies. Azerbaijan is a secular Muslim state with a constitution assuring freedom of worship and equality to everyone. It is not uncommon to see young people listening to pop stars on their iPods, and covered women are not, at all, the norm. The streets of Baku teem with moderns, dressed in the fashion of any upscale Western capital. The president’s wife, Mehriban Aliyev, is an educated and decidedly modern woman with a career in medicine (an ophthalmologist) and a penchant for stylish designer clothing. In her role, she encourages women to be educated, independent and sophisticated in their life choices. On the flip side, in many other Islamic republics women are stoned, subjugated to men, and held to rigid standards of dress and behavior. Azerbaijan neither stifles nor represses its young women, but rather provides them with role models for a contemporary Muslim woman. It is a place where Muslims participate in a modern lifestyle, and still value and protect their religious ideals. This is also the policy of Israel, a country that—despite the propaganda and lies that regularly infect the world media—is an open society where Jewish people of all walks and Arab Israelis of all religious attitudes are not only welcome, but also govern the country in the Knesset (Israel’s parliament) and public offices. So why are perceptions so opposed to the truth about both Israel and Azerbaijan, two quite accepting and open societies? In Israel’s case, it is quite obvious that the use of such lies and propaganda are designed to alienate and separate the Jewish state from the good graces of the world—to yet again villainize Jews and set them apart from the rest of society. For Azerbaijan, it is partly a case of mistaken identity. Although the results are the same for both countries, the intent is different. Azerbaijan is lumped in among a cadre of countries that have too loud a voice and behave badly on the world stage. This is much like a child who is related to a criminal by birth, and spends his life doing good deeds with the hope of separating himself from his evil relative. Exacerbating the situation is the penchant for Westerners to simplify issues. In this case, the perceptions are “all Muslims are bad;” “all Muslims are Arabs;” “all Arabs are Muslims;” and “all Muslims are the same.” Of course, none of these statements are true. Azerbaijan and Israel have found a friendship in their commonality of shared open societies. Yet one is Muslim and one is Jewish, so how can this be? Watching these two countries coexist and deal with one another, it is actually quite easy to understand. Each year their trade and joint scientific, military, agricultural, and other business projects increase, and each nation is welcome and inviting to one another. Azerbaijan and Israel are regularly visited by each other’s high-level officials, and all are welcomed with deserved pomp and circumstance. But it must be said that Iran and the other evil empires in the Middle East put enormous pressures on Azerbaijan to fall in lockstep with their worldview, and the threats are tough and genuine. Azerbaijan is a thorn in the side of Iran, a country that seeks to control the world through an extremist Islamic caliphate. In Iranian eyes, a modern Muslim nation like Azerbaijan that is thriving is a deterrent that must be dealt with in the harshest of terms. Azerbaijan often finds itself between its own moderation and the proverbial “rock and hard place” known as Iran. As Iran grows stronger, and it seems the current U.S. administration is determined to allow this sad state of affairs to occur, there is no doubt Azerbaijan will feel the sword of its neighbor bearing down. One cannot predict how this will influence religious practices or its strong alliance with Israel, but from past encounters it seems Azerbaijan is resolute to walk its own path and control its own destiny. No matter how far the friendship with Israel progresses, one must applaud this young nation of only 22 years for its fortitude and unwavering battle against the stereotypes and the pressures of militant bullies. Azerbaijan stands alone in its success as a prosperous and open Muslim society, and its friendship with Israel is proof there is room for a progressive, secular Muslim nation on the world stage. Norma Zager is an award-winning international journalist and a professor at California State University, Los Angeles.